Learn about the history of the Steepletop Preserve. 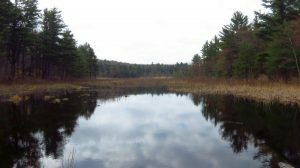 Description: Learn about Steepletop Reserve that is Berkshire Natural Resource Council’s largest property. With more than 1,200 acres, miles of wood road, and expanses of wetland, mature forest, and young forest, there’s a lot to explore. With Steepletop and adjacent land, a block of nearly 5,000 contiguous acres of land is permanently conserved. Please wear sturdy footwear and long pants, bring water, and a snack or lunch. We may venture off trail to view old foundations and structures. As we enter hunting season, please remember to wear your orange! Directions: From Great Barrington, take Route 23 east to Monterey. Just after the Monterey line, bear right onto Route 57/183 into New Marlborough. Just before the Old Inn on the Green in New Marlborough, turn left onto New Marlborough-Monterey Road; follow for 1.6 miles. Turn right at the steep, inclining driveway marked “684”. Bear right into our gravel parking lot at the top of the little hill. The trails begin right at the trailhead parking; there is a kiosk just beyond the gate. Email mauman@bnrc.org or call BNRC at 413-499-0596 with any questions.